The country is shivering with freezing cold which left over a dozen people dead and hundreds infected with various cold-related diseases. The lowest 2.6 degrees Celsius was recorded at Tentulia in Panchagarh on Monday, showing a 50-year low, the Met office said. The country’s lowest temperature of 2.8 degrees Celsius was recorded in Srimangal in 1968, meteorologist Abdur Rahman said. Besides, the country experienced lowest 3.2 degrees Celsius in 2013, 4.5 degrees in 2011 and 3.3 degrees in 2003. The Met office recorded 9.5 degrees in Dhaka on Monday. “The cold wave sweeping across the country accompanied by dense fog will continue for two more days,” he added. “Several more cold spells may sweep across the country this month,” he also said. The calamitous weather has already claimed 12 lives and disrupted ferry services. Sources said at least 12 people, including six children, have died of cold-related diseases in Rajshahi, Kurigram and Thakurgaon. The sky was overcast with fog in the northern region with a cold wind coming from the nearby Himalayas. Many people are found lighting fire in different places to protect themselves from the biting cold. Moderate-to-thick fog may occur over the country on midnight till morning and it may continue in some places till noon, the Met office forecast. Poor visibility created during night due to dense fog increased fatal road accidents. The Met office recorded 2.9 degrees in Saidpur upazila and 3 degrees in Dimla of Nilphamari, 3.1 degrees in Rajarhat of Kurigram, 3.2 degrees in Dinajpur, 4 degrees in Badalgachhi in Naogaon, 4.9 degrees in Rangpur, 5.3 degree in Rajshahi, 5.4 degrees in Chuadanga, 5.5 degrees in Pabna and Bogra and 5.6 degrees in Jessore. Amid the cold spell, people, especially the poor and the elderly, have been suffering a lot from the cold weather. 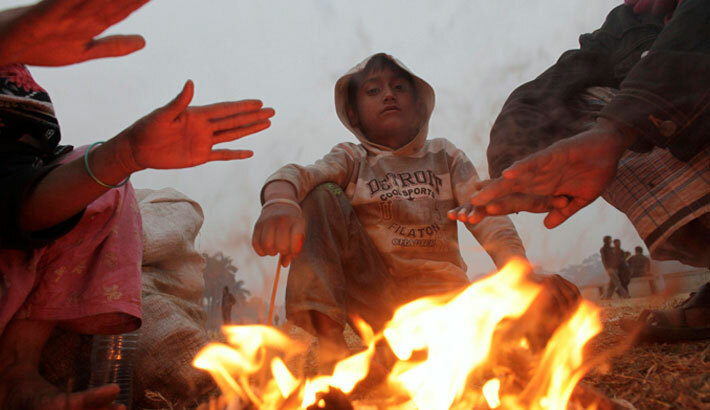 Children and elderly people are the worst sufferers from the cold while the poor are heating themselves in bonfire. Normal life and business activities were crippled due to the bone-biting cold. Day labourers and slum-dwellers are suffering much for shortages of warm clothes. The cold spell is caused cold-related diseases, including pneumonia, asthma and respiratory complications, in the northern districts. The number of patients with cough, asthma and other cold-related diseases has marked a sharp rise in different parts of the country, hospital sources said. Dense fog may hamper natural growth of crops, including Boro seedlings. Failure of cash crops may result in unemployment of agro-labour. The movement of aircraft and river vessels, including ferries, got disrupted due to dense fog in many places. Motor vehicles plied the streets with their headlights on in the foggy morning hours. Three ferries remained motionless in the middle of the river while 13 more remained anchored at Paturia and Daulatdia ghats. About 300 hundred vehicles, including buses, trucks and cars, got stranded on both sides. Sources said four children have died of pneumonia in Rajshahi, six in Kurigram and two in Thakurgaon. A total of 271 children have been admitted to Rajshahi Medical College Hospital while 156 people to Kurigram Sadar Hospital with cold related-diseases.